Home Task Management How to create a quick task ? How to create a quick task ? You can create a quick task by following way. Go to the task list page. Due date:- Specify the date when the task will be finished. Task type:- Define the type of the task.Task types are a custom task attribute that allow you to categorize tasks in a meaningful manner. 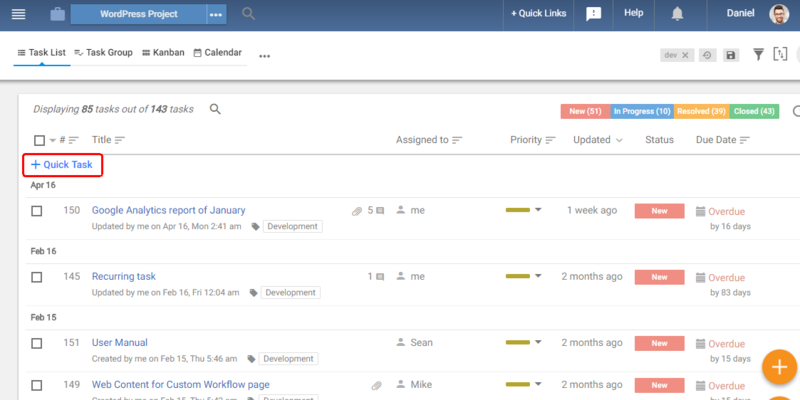 There are a few Default Task Types available in Orangescrum with the freedom for you to define your own task types that are relevant to your projects and team. When you set a Default Task Type during project creation, all tasks that you create in that project will have your pre-defined Task Type as set here.For example, a Project Manager creates a task, add the task type as ‘Development’ and assigns it to the developer. The developers can easily filter out the tasks that are marked for ‘Development’ and can start working accordingly.Similarly, when QA team find bugs they can classify a taskas ‘Bug’, and make it easier for the developers to filter the Bug tasks and fix the bugs accordingly. Once the details are added click on “Save“.